I took our 2000 Camry in for a regular maintenance check this morning. It’s been a great car, but at 7 years old and 133,000 km, I think the old girl might be past her prime. When the dealer called me to review the problems they had found, I wasn’t surprised that it was a lengthy list. Actually, it was mostly small stuff – new sparkplugs, new sparkplug wires, flush the brake line, fix a little oil leak, etc. Oh yeah, and four new tires and alignment. Total cost: $2,151.34. I almost laughed at the guy. That’s a lot of money. That’s like two new iMacs, seven new iPods, a whole new set of cymbals, or about a month of daycare for the boys. Needless to say, we opted to do nothing for the moment. I mean, what good are sparkplugs anyway? We’ve been thinking about getting a new car for a while, so this really cemented the decision for us. Based on a careful examination of our current and future needs, our finances, fuel efficiency, safety ratings, and available colours, we’ve narrowed it down to two options. 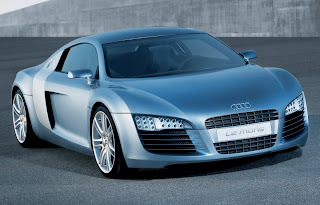 Option 1: My choice is the Audi R8. It features a 4.2 L V8 engine that produces 414 hp. It goes from 0 to 60 mph in 4.0 seconds and has a top speed of 301 km/h. It is a total babe magnet. 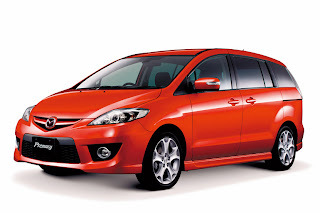 Option 2: B likes the Mazda5. It seats six. It should be an interesting negotiation. You’re thinking of a babe magnet for the boys. Right?